Image caption The IPCC found the police officers used "necessary and proportionate" force. 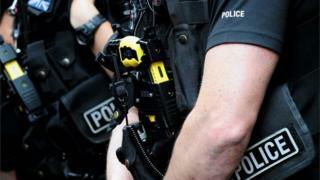 Officers who Tasered a man armed with two knives 11 times, hit him with a car and shot him used reasonable force, the police watchdog has found. Metropolitan Police officers fired on Joseph Hive several times with a stun gun in Brent, north-west London on 8 October 2015. When the Taser had no effect, they struck him with a patrol car before shooting him. Mr Hive, 30, was later taken to hospital with chest and arm injuries. The police had been called after Mr Hive had been seen wielding two blades in the street. Officers later reported that he had refused to drop the knives and was a danger to himself and others. Mr Hive was armed with two knives and a screwdriver and later convicted of possession of offensive weapons and common assault, the Independent Police Complaints Commission (IPCC) said. The IPCC's investigation found the officers had used "necessary and proportionate" force. IPCC commissioner Cindy Butts said: "Officers were faced with a man armed with knives who seemed intent on using his weapons on a public street. "They needed to stop him from causing serious injury or death to them, a member of the public, or himself. "Taser was fired a total of 11 times. The man was found to be wearing extra clothing, which we believe reduced the effectiveness of Taser on at least one occasion. "Yet he still posed a real danger to officers, leaving them with no option but to use further force."